It's rare in a life with kids and flights and work and general responsibilities, that I ever get to plant myself and watch an important Yankee playoff game from start to finish. 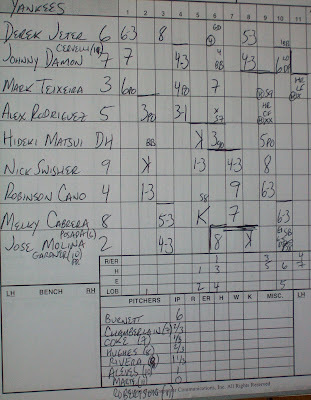 But I had a block of time and I dusted off my Bob Carpenter's Scorebook and decided to keep score. It's something I had done hundreds of times in my youth, and occasionally as a professional, but I did it tonight for fun and to take me inside the game. After an 11-Inning thriller over the Twins, this becomes part of the archives of baseball history. Well at least my baseball history. 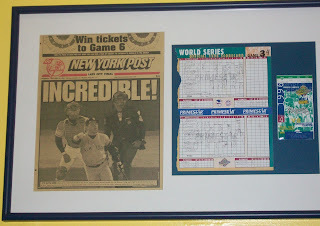 I have a couple of framed scorecards in my office, that are mounted with my World Series ticket and New York newspaper headline. Like when I watched Jim Leyritz tag Mark Wohlers in Game 4 of the 1996 World Series. Leyritz had replaced Joe Girardi at catcher, who had been 0-2. Rookie-of-the-Year Derek Jeter was 2-4 with 2 walks and 2 runs scored. I had FOX seats so I sat next to Jerry Glanville, but that's a story for another time. The scorecard is a historical document. With a good scorecard you can reconstruct any baseball game, and thumb through the pages of history. The previous entry in my third BC Scorebook was from June 11, 2006. Oregon State defeated Stanford 15-0 in Super Regional Game 2 in Corvallis en route to the CWS and the first of two NCAA Championships. Catcher Mitch Canham drove in 5 runs and Pitcher Jonah Nickerson cruised. So what was the inside dope on just another Yankee walk-off Home Run in the bottom of the 11th? 1) Joe Girardi is still manging very tightly. Especially his handling of the bullpen. Joe, why on earth do you need 8 pitchers to get through 11 innings? He shouldn't have pulled Joba Chamberlain after getting only 2 outs in the 7th. He shouldn't have pulled Alfredo Aceves after a scoreless 10th. They weren't prepared to fight this out until the 15 or 16th inning. I was wondering at what point Game 1 winner CC Sabathia was going to start warming up. 2) The Yankees were very lucky in this game. The Twins left 17 men on base, including at least one in all 11 innings. AJ Burnett walked 5 and hit 2 batters in a very erratic 6 innings. But he only gave up one run. The Twins made a brutal baserunning error in the 4th, costing them a run. And Joe Nathan was 3-0 to A-Rod in the 9th, but tried to get him out. Not too effective. 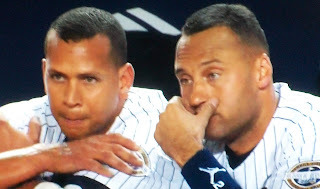 It got A-Rod a curtain call and a seat in first class. 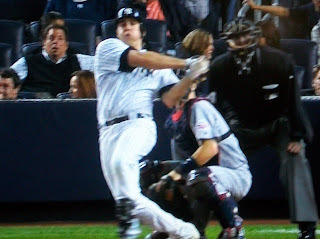 3) When the game is on the line, you want Mark Teixeira. And that was that. Close the book on that one.